It was late afternoon when I came across these two. 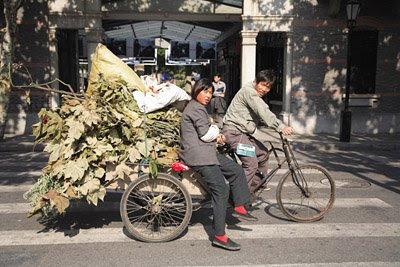 They were hauling branches on a bicycle along one of the leafy boulevards of Shanghai’s French Concession. I like the woman’s red socks and how she sits with ease on the edge of the cart. Her companion peddled effortlessly, as if he did not have a person and cargo to transport. I love this one too - especially the red socks! I have similar pics from Shanghai. It's the confidence of the woman that's so appealing, isn't it? Thanks again Lara. Shanghai is one of my favorite cities to visit and photograph.